Who knows how to make you laugh? The Nose Knows! 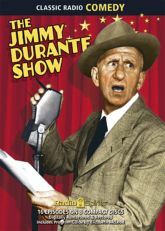 Here's the one, the only�Jimmy Durante! And he brings you his distinctive blend of raucous slapstick and aggressive wordplay, overlaid with just a touch of lovable sentimentality. Here are sixteen half-hour broadcasts of boisterous fun, featuring Arthur Treacher, Victor Moore, Candy Candido, and Peggy Lee. And you'll hear a whole barrel of famous guest stars, including Lucille Ball, President Harry Truman, Dorothy Lamour, Van Johnson, and more!